The Old Haunt: A Darkwing Duck Forum Main Menu Duck Talk DuckTales is back! So far, I really like the new DuckTales. Sometimes it gets a bit too focused on the characters, but by now it has had some great adventures, too. 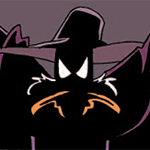 I'm a bit disappointed that Darkwing Duck ia a TV show in universe, but the producers have promised to do more with it. However, new episode today. Or is it tomorrow? I'm in germany, don't really know what time it is in the US right now.